Alaina Stellwagen, Katie Hunger, Maria Mendez, Maddy McTigue, Reid Cooper, and Peter Nicieja contributed to this story. Following the results of the faculty vote of no confidence, which were released the morning of Nov. 19, several DePauw faculty, alumni and students have spoken out. She said that the most important thing is for the Board of Trustees to take some form of action to show they value the voice of the faculty. 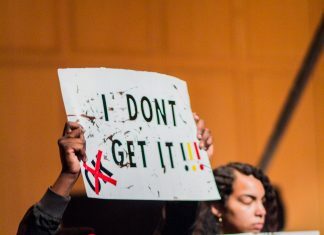 “Whether it means the Board of Trustees takes action against President McCoy or whether it means that they are making changes to maybe retrieve some confidence from the faculty members,” Halffield said about the Board of Trustees showing support for the faculty. Amanda Meyer Clark ‘97 also stressed the importance of the role that faculty play in shaping the DePauw experience. “The faculty is the heart’s blood of an institution, not the pretty buildings or even, many times, the students. The faculty guides students to their greatest potential,” Clark said. Armaan Patel ‘18 said he hopes that the results of the vote of no confidence lead to more transparency from the Board of Trustees. Patel said he was happy the faculty were taking a stand, but was unhappy that this was the stand they had to take and reiterated Meyer Clark’s point. “The faculty are, without a doubt, the backbone of DePauw University. Stifling pay raises and making changes to faculty insurance policies places a burden on our faculty that simply shouldn’t be there,” Patel said. Computer Science Professor Doug Harms, who has worked at DePauw for 21 years and has never been part of a no confidence vote, shared Patel’s conflicted view. “I think the fact that we’re here indicates a lack of trust between members of the community. I think it’s sad that we’re in this position to even have a vote of no confidence,” he said. The results of the vote showed that 83 members of the faculty voted “yes” to having no confidence in President Mark McCoy, while 64 faculty members voted to abstain, and 59 voted “no,” indicating that they do have confidence DePauw’s president. Rebecca Schindler, professor of classical studies, clarified that there may be more to the numbers than meets the eye. Schindler was also a signatory of a Nov. 14 Letter to the Editor that outlined the reasoning behind the signatories’ decision to abstain on the vote of no confidence. Matthew Welch ‘11 reflected on his time at DePauw and compared it to the current climate. Harms, who called the vote of no confidence process “an interesting experience,” said he thinks this vote is actually the first step towards a solution. Junior Austin Lewis, a member of Democratic Socialists of DePauw and an organizing member of the November protest during the Board of Trustees meeting joined Harms in looking towards the future. “I wonder and am excited to see the next steps that happen because as far as I know, this is completely unprecedented in DePauw’s history to get this far with a no-confidence vote,” he said. Schindler also agreed with Harms’ belief in working together to find a solution to the current issues. Welch, however, is not so sure the University will take the steps he feels are necessary to move forward.